2010 ended on a rather difficult note, so it is only now that I find myself making the first post of 2011. In any event, I'm still walking and talking, so I guess there's not much to complain about. This year I've resolved to complete all the near-finished models that I have laying about in order to clear out some benchspace for starting my 1/72 Dora railway gun. The first two kits that I'm almost done with are the Armorfast T-34 mentioned in a post from 2008, and a Heller SOMUA S-35. The models still need markings and to be weathered, but are otherwise mostly finished. The only problem I have is to find some way to simulate lenses for the headlamps. I'll probably just shape some pieces of clear sprue and glue them into the appropriate areas already carved into the headlamps. 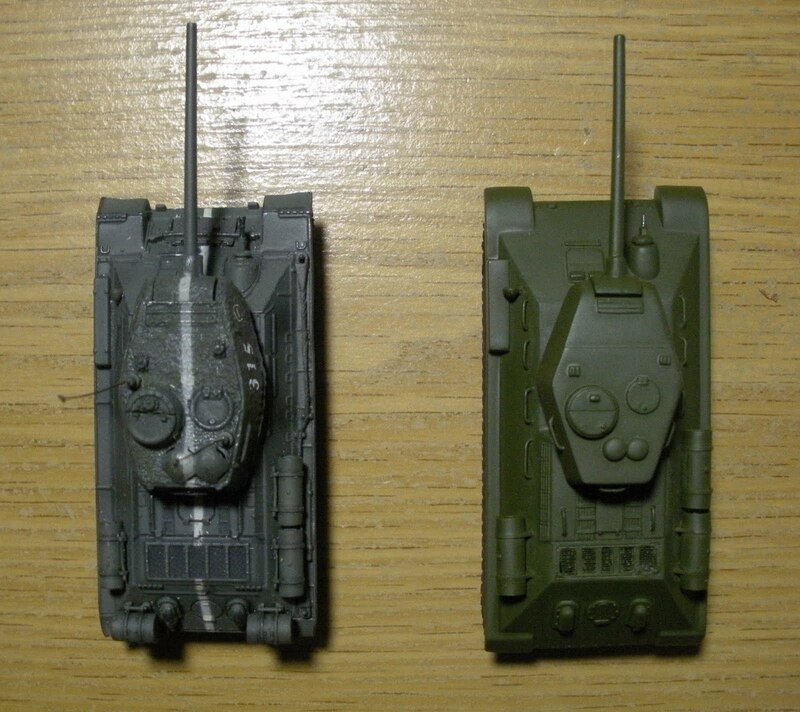 The Armorfast T-34 is slightly taller, and slightly longer than the FoV T-34, but the turret of the FoV T-34 is larger than the turret of the Armorfast T-34. I have no idea of which is more accurate. I'm not sure if it is so obvious in this picture, but I used a heated splatter screen to make tread pattern imprints in the previously smooth tracks of the Armorfast kit. They're not the prettiest or most accurate tracks you'll see, but better than the smooth featureless treads of the typical quick build kit. 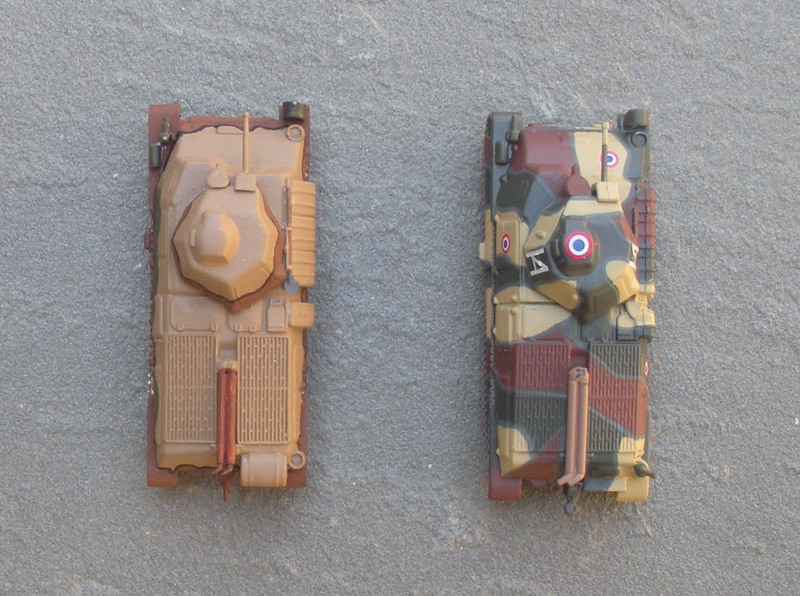 I believe that these are the only S-35s in 1/72 scale. They're practically identical in size. The Heller kit is actually rather nice, despite soft details and the horrible tracks. I actually would like to build a couple more of these sometime in the future. 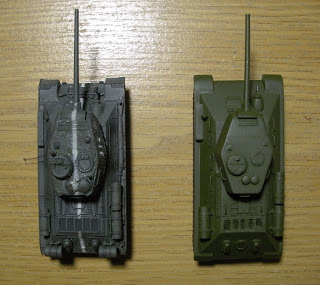 Nice looking tanks,I am looking for some T-34/85's for the Balkans war. @Lobo, Thanks for the comments. @Rich, I don't recommend the Armorfast T-34 for your project. There are a lot of nice T-34/85s out there, but I'm guessing the lack of models with the starfish wheels is it your main problem.